Every election season when politicians unleash their expensive and (usually) unimaginative attack ads, op-ed writers invoke the unofficial title of the most notorious 60 seconds in advertising history: "The Daisy Ad" (official title: "Peace, Little Girl," aka "Daisy Girl," "The Daisy Spot, "aka "Little Girl � Countdown"). 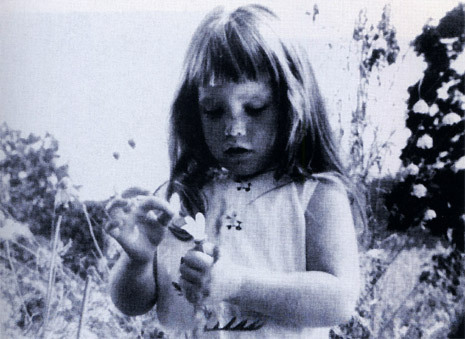 The spot features a little girl picking petals off of a daisy in a field and counting out of sequence just before an adult voiceover interjects a "military" countdown which is then followed by stock footage of a nuclear explosion and the cautionary words of President Lyndon B. Johnson: "These are the stakes � to make a world in which all of God's children can live, or to go into the dark. We must either love each other, or we must die." 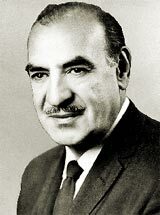 The ad � which never identifies its target � was aimed at reinforcing the perception that the 1964 Republican candidate for president, Senator Barry M. Goldwater, could not be trusted with his finger on the button. 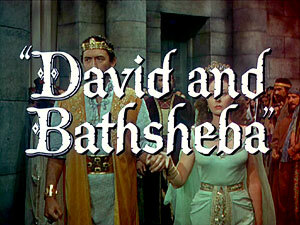 As has often been recited, the Daisy ad aired only once as a paid advertisement � on NBC during the network movie (DAVID AND BATHSHEBA) on Monday, September 7, 1964. [ 5 ] Since that long ago Labor Day, the film of the child and her daisies has been re-played millions of times. The spot was and still is a masterpiece of manipulation, juxtaposing the playful innocence of childhood with the protocol and horror of war. The simplicity of the message was made all the more effective because the 1964 campaign took place less than two years after the Cuban Missile Crisis and within three years of the Berlin crisis in which President John F. Kennedy rattled the nation with his remarks on the importance of civil defense. [ 6 ] In other words, the "end of the world" was not an abstract concept for most Americans during this period of the Cold War. It was a very real possibility. Fragments of the story behind the evolution of this notorious advertisement have been published numerous times over the decades. But not until now has the full history of the spot been told in all its strange glory. CONELRAD has spent the last year examining every aspect of this remarkable moment in popular culture. We have interviewed people involved with the ad—including the Daisy Girl herself—who have never or who have rarely spoken on the record about the spot. Numerous government documents, private papers, books, magazine and newspaper articles were also reviewed so that the complete record could be presented. 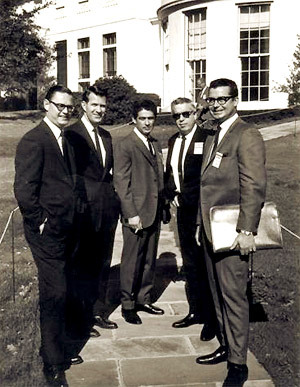 The "Daisy" story is a tale of how a group of dedicated men from various backgrounds in government and advertising came together to sell a "product"—the President of the United States. These professionals succeeded spectacularly in their primary objective (no matter that Lyndon Johnson turned out to be defective merchandise), but they also created an indelible icon of the Cold War in the process. This is how it happened. Much has been made of the late President's amorous proclivities, but he also somehow managed to fit a tremendous amount of reading into his busy schedule. 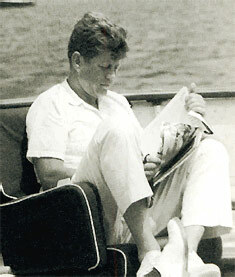 "Kennedy takes printer's ink for breakfast," James Reston of the New York Times once remarked. [ 8 ] The young President was also widely known to have an astounding facility for recalling the details of what he perused. 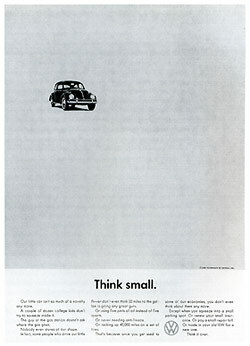 The advertising campaigns for Avis Rent-a-Car ("We try harder") and Volkswagen ("Think Small") made such an impression on Kennedy that he asked brother-in-law Stephen E. Smith to approach the firm that produced them � Doyle Dane Bernbach (DDB) � to ascertain whether the agency would be open to the prospect of working on his '64 campaign. The President's 1960 ad man, Jack Denove (who was still owed money from that work), was also asked to come up with a media proposal for the upcoming election season. [ 9 ] And then fate intervened in Dallas. By the end of the grueling campaign, the ad man was no longer squatting in a borrowed cubicle. He had an official office and was separating his clean laundry from his dirty laundry in the drawers of his desk. [ 21 ] One of Lloyd Wright's criteria for choosing DDB was "commitment." He certainly got that and more with the agency that, like Avis, "tried harder." One need only compare the televised political ads of the 1950s to those of the Johnson campaign in 1964 to realize just how innovative DDB was. The presidential campaign spots of the previous era (including Kennedy's in 1960) are absolutely prehistoric while DDB's '64 ad work looks—even today—astonishingly modern. It was Bernbach, the creative partner in the triumvirate of DDB co-founders, who revolutionized advertising into a true art form. 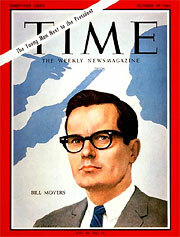 "It was like the Bauhaus of advertising," stated Myers in his CONELRAD interview. 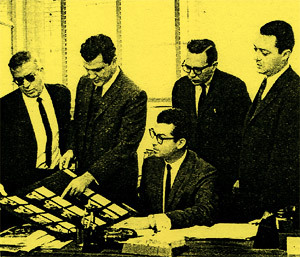 DDB was founded by Ned Doyle, Maxwell Dane, and Bernbach in 1949. Doyle and Bernbach had been vice presidents at Grey Advertising and Dane was a tennis partner and former associate of Doyle. The three founders each brought considerable and distinct skills to their new business endeavor which ended its first year with just $500,000 in billings (by 1959, the agency was billing $27.5 million annually). 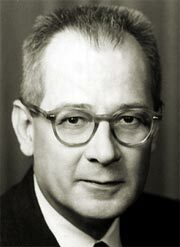 Dane handled administrative and financial matters, Doyle, a lawyer by training, handled the client rainmaking and Bernbach was the creative force who changed the face of modern advertising technique. The Brooklyn-born Bernbach graduated with a major in English from New York University in 1933 and was, by many accounts, a soft-spoken intellectual who liked to infuse his copy with a subtle yet irreverent sense of humor. 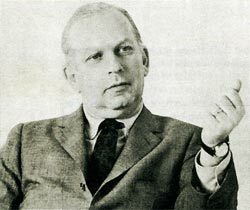 Before serving in World War II, Bernbach worked as a writer and researcher for the 1939-1940 World's Fair and got a job at his first advertising agency, William H. Weintraub, Inc., soon after. Bernbach had once explained his professional philosophy to an interviewer as follows: "Creativity can be talked about, like the weather or sin. We really sweat at it here. We believe that good taste can be good selling. The whole history of art and literature is the effort of a people to try and say or create something in a fresh, imaginative way." Bernbach, who sympathized with the public's distaste for the "hard sell," shunned marketing research and embraced instinct. "Artistry, by and large, is having deep insights into human nature and then expressing it in a very, very fresh way � an original way," he was quoted by the New York Times in 1982. One of the ways he fostered this approach at DDB was to break with the traditional agency organizational model and institute what was dubbed a "horizontal hierarchy." "In most agencies the copywriter and the art director never worked together, explained Myers for CONELRAD. "The copywriter would not work with the art director. At DDB, that was different. DDB innovated the partnership." Bernbach also insulated his "Creative Teams" from the outside pressures of sales demands, freeing them to focus on their more purely inspirational tasks. In Barry Goldwater's 1988 autobiography "Goldwater," he admits "I made too many joking references, like �lobbing one (a missile) into the men's room of the Kremlin.' (Boy, did I pay for that offhand quip!). "[ 23 ] He certainly did. But Goldwater also made serious, frightening proposals regarding nuclear weapons that handed the Johnson campaign a red hot issue to exploit. Contrary to popular belief, Johnson's strategists were not the first people to saddle Goldwater with the itchy nuclear trigger finger image. 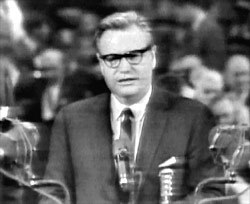 During the make-or-break presidential primary race in California, the senator's moderate opponent for the nomination, Nelson Rockefeller, unleashed a mass mailing of a pamphlet entitled "Who Do You Want in the Room with the H Bomb?" The pamphlet, produced by Rockefeller's ad firm in California, Spencer-Roberts and Associates, was a collection of Goldwater's shoot-from-the-hip comments. It was delivered to all two million registered Republicans in the state and sparked a boomlet of controversy. The costly mailing, however, was effectively defused by "nature," as Stu Spencer put it, when Rockefeller's second wife, "Happy," gave birth to a baby boy just before the election: "It reopened the wounds of being a woman-chaser, of adultery, all the Goddamned questions we had fuzzed over by accusing Goldwater of being a madman. "[ 26 ] Goldwater won the June 3rd primary and Rockefeller was memorably booed at San Francisco's Cow Palace during the GOP convention. The party had made a sharp right turn that would not soon be forgotten. You fellows are the experts, but this is how I see it. I'm the president. That's our greatest asset. And I don't want to piss it away by getting down in the mud with Barry... My daddy once told me about the time a fire broke out in a three-story building in Johnson City. Old Man Hutchinson was trapped on the third floor and the fire ladder was too short to reach him. So Jim Morsund, he was one of the volunteer fire chiefs, grabbed a piece of rope, tied a loop in it, threw it up to Mr. Hutchinson, and told him to tie it around his waist... Then he pulled him down. Lloyd Wright recalled for CONELRAD the formal advertising plan against Goldwater: "Our strategy was to open with what we called �anti-Goldwater' to put him on the defensive and show him for what we thought were his weaknesses and then go into a pro-Johnson and then a �get out the vote.' Those were the three stages. And those stages became quite changed in reach and tenure because of the impacts of the opening effort. We didn't need to continue—we felt—as long a time on the anti-Goldwater phase and that was partially a result of the impact of the Daisy commercial." To aid DDB, the fruits of the 5 o'clock Club's opposition research and all of the other ancillary ammunition collected against Goldwater was provided to the advertising team. "We were given a big blue book of all of Goldwater's speeches from, I guess, from the time he started," Sid Myers told CONELRAD. "And we were given themes. The most important was nuclear responsibility because at the time he (Goldwater) was saying we should use tactical nuclear weapons in Vietnam. And the war on poverty and Social Security. Those were the big three campaign issues that we were working on." Wright remembered the environment as being more staid: "Well, when I was with them (DDB), it wasn't hustle bustle. It was very determined and focused. Very dedicated and professional and committed to the success of the campaign." For Myers, one of the major highlights of working on the campaign was meeting President Johnson. "He's a massive guy," Myers marveled all these years later. "I mean I'm a big guy, I'm six foot, but he towered over me... We were kind of like ushered in and he shook my hand and said 'You guys are doing a great job, blah, blah, blah' and that was the end of it—he was gone." On August 12, 1964 Goldwater held a highly publicized GOP unity conference in Hershey, Pennsylvania that included former President Dwight Eisenhower and former Vice President Richard Nixon among other party elite. The meeting sought to allay the fears of mainstream Republicans and better position Goldwater for the general election campaign. To that end, Goldwater promised that he would consult Eisenhower and Nixon on key cabinet appointments should he be elected. The GOP nominee clarified in his speech prior to the meeting whose backing he did not want: "I seek the support of no extremist—of the left or the Right." He added that he and his running mate William E. Miller "repudiate character assassins, vigilantes, Communists and any other group such as the Ku Klux Klan that seek to impose its views through terror of threat and violence." If a decision isn't taken immediately to activate the television advertising plans, there might be serious consequences to the campaign. This is no time for me to be tactful with you. There is too much at stake. No one knows better than you why we took on the Presidential campaign. There is only one reason. We are ardent Democrats who are deadly afraid of Goldwater and feel that the world must be handed a Johnson landslide. To play our small part in the achievement of such a victory we risked the possible resentment of some of our giant Republican clients (I personally told one it was none of his business when he phoned me about our action) and we had to turn away companies who wanted to give us their accounts on a long term basis. Two of the other agencies you were considering withdrew out of fear of their clients. A third agency blithely withdrew and took the Goldwater account. I tell you all this only to emphasize that we are dedicated people and that our recommendations have a single motivation, not how much money can Doyle Dane Bernbach make, but what is necessary to do the job well. For anyone in your organization who is not a communications expert to pass on our plan is a great mistake. The decision must be made on the same basis that Secretary McNamara said the Defense budget decision was made: "What arms do we need to be the strongest nations [sic] in the world. Then, and only then, see how we can achieve our goal." Our plans were made with expert knowledge of what it takes to saturate the nation with the Democratic message. Ignorance in these matters can lead to waste and even disaster. 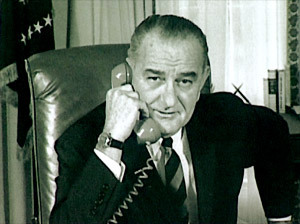 It is dangerous to think that because Lyndon Johnson is the President of the United States, he will get enough exposure through news coverage to assure him election in November. I don't have to remind you that an exposure on TV or radio or a quote in the nation's press is not necessarily a call to action. The recommendation, at the volume originally agreed upon, was set as a maximum effort � an ideal campaign. The thought being to permit you to trim where necessary in the interest of political or financial necessity. I understand you now feel we should suspend all ordering and production on everything we have recommended except the network time already purchased. We consider the local spot TV and spot radio as absolutely essential to the goal of commanding the necessary share of mind required to get the vote we need for President Johnson in November. I refer you to the attached media flow chart. Everything not currently on non cancellable order with the networks is crossed out in red. It is immediately apparent that the remaining schedule is grossly inadequate for the eight week period of the campaign. The stakes are just too high to neglect taking maximum advantage of a medium that reaches 92.5% of all homes in the United States. There is no denying the influence television had on the last election; and in 1964 there are 8,550,000 more television sets in use in this country than there were in 1960. I urgently request that you reconsider and permit us to proceed on the original recommendation at once. If it is necessary to make some adjustment because of financial necessity we will work with you on making a realistic adjustment. The need for immediate action can't be expressed too strongly. Assuming agreement on a spot TV and spot radio schedule next week, and assuming the necessary money being released for use at the same time, the earliest nationwide air date we can make would be the third week of September. This is inflexible. The simple logistics of purchasing, production and shipping preclude any miracles in shortening the time needed. We agreed that a very necessary part of the campaign is that part devoted to exposing to the voting public the absurd, contradictory and dangerous nature of the opposition candidate. It was agreed that this part of the campaign should be undertaken immediately following our Convention. It is already apparent that Barry Goldwater is making every effort to adjust his extreme position to one more acceptable. Knowing the short memory of the average person, it is entirely possible he might succeed in creating a new character for himself if we are unable to remind people of the truth about this man. If a decision is delayed until after the Convention, it is obvious that the action resulting from that decision might be "too little and too late." I urge your immediate attention to this important matter. The stage was now set for the formal campaign to begin.